My name is Hiroko Nakajima. I’m a Japanese born London based fashion knitwear designer/artist. 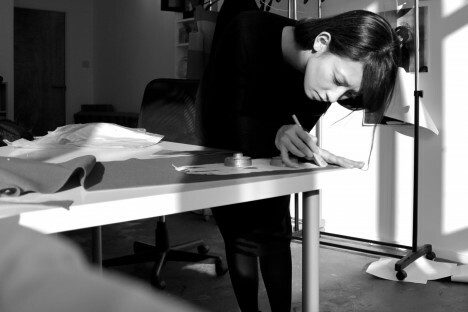 I graduated from Central Saint Martins MA fashion course in 2012 and started my own label . I had just been working for an artist Julie Verhoeven making some objects for her upcoming exhibition in Holland. It was too exciting! I get my creative energy from various art works and theatrical performances as I love going to galleries and museums and I think there is something magical for things happening on stage. To work broadly within art and design and so to make all the boarders blur. I’m planning to do a few art exhibitions this year. Could you tell us about London? What do you like about it? I like that cheap does not necessarily mean bad here and expensive does not prove its quality. Please tell us about your favourite places in London (to eat, shop, going out, etc). I live and work in east London, so most of my activities are in the area of Dalston and Shoreditch. I love going to the markets early in the morning too.